In 2006 Jamie Tworkowski wrote a story called “To Write Love on Her Arms” about helping a friend through her struggle with drug addiction, depression, and self-injury. The piece was so hauntingly beautiful that it quickly went viral, giving birth to a non-profit organization of the same name. Nine years later, To Write Love on Her Arms (TWLOHA) is an internationally-recognized leader in suicide prevention and a source of hope, encouragement, and resources for people worldwide. Jamie’s words have been shared hundreds of thousands of times online. They’ve shown up on T-shirts and posters and even tattoos. Now, for the first time, Jamie’s writing is available in the form of a book. If You Feel Too Much is a celebration of hope, wonder, and what it means to be human. From personal stories of struggling on days most people celebrate to offering words of strength and encouragement in moments of loss, the essays in this book invite readers to believe that it’s okay to admit to pain and it’s okay to ask for help. 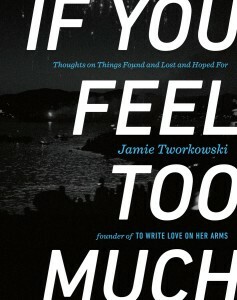 If You Feel Too Much is an important book from one of this generation’s most important voices. Don’t get me wrong. It’s not that i don’t like love. i love love – i think it’s the best thing that happens on the planet. It’s the biggest dream inside me. But i bought a lie somewhere along the way. i bought the lie that says i’m not alive if i’m not in love. i bought the lie that says if i love someone but then they stop loving me or they start loving someone else, then i must have no value or power or worth. i bought the lie that says if i’m not in love, then i’m as good as dead. I had no idea who he was until then, until I found out that he is the founder of To Write Love On Her Arms (TWLOHA), “…an American non-profit organization that aims to to present hope for people struggling with addiction, depression, self-injury and thoughts of suicide while also investing directly into treatment and recovery.”1 I found out about TWLOHA back in college, I think, because some of my favorite bands (Switchfoot, Anberlin, Dave Barnes, Matt Wertz, etc) support the organization. That’s the most that I knew about Jamie and TWLOHA, and I was vaguely aware that there was a book coming out. When I received an email from the publicist asking if I wanted to review the book, I immediately said yes because if most of the book contained nuggets of wisdom like that quote that Isa shared to me last time, then I definitely want to read this book. If You Feel Too Much is, at its core, a collection of Jamie Tworkowski’s blog entries through the years. The topics range from work, family, friendships, romance, love, addiction, depression, self-injury, and brokenness. That’s a lot to digest, but since these came from blog entries, they’re really easy to read. If you’re reading this as a memoir with a chronology of events, you might get a bit disappointed because some of the chapters feel a little bit disjointed, and sometimes some of them seemed to carry the same thought. Some of them may even be seem too short, but that’s easy to overlook because the everything here is full of heart. More than being readable, this book is super relatable. It doesn’t matter if the context of the entry is different – there’s some sort of universal truth that makes the reader connect to the things you read in this book. Jamie’s thoughts focused a lot on reaching out, on being a friend, on opening up to people and offering love. Inversely, he also talked about how if we don’t have the strength to reach out and to offer love, then it’s okay. We don’t have to be strong all the time — sometimes, we need to be on the receiving end, too. If You Feel Too Much does not just tell its readers that we are not alone, but more importantly, we all have a part to play in this life. As Sierra De Mulder (who was mentioned in the book, too) wrote: your voice is someone’s favorite voice, your face is someone’s favorite face. If You Feel Too Much is all about the pain and beauty and loss and hope that makes up our being human. If you feel too much, too, then this is the book for you. Read it all in one sitting, or read it bit by bit – if only to remind yourself of the truths that we often forget about ourselves. If you feel too much, don’t go. You are not alone in these places. Other people feel how you feel. You are more than just your pain. You are more than wounds, more than drugs, more than death and silence. There is still some time to be surprised. There is still some time to ask for help. There is still some time to start again. There is still some time for love to find you. Your heart is writing a poem on the world and it’s being turned into a thousand songs. That guy with tears in his eyes and ghosts in his heart. He loved her, and you could see it. You could see it and you told him it wasn’t his to carry. You told him about grace, and you told him about the song. And you believed it. You were certain of it. So if it’s true for him, isn’t it also true for you? And that diamond ring. I know you think about it a lot. That ring does not define you. It never did. Then or now. You can wear it around your neck. You can throw it in the sea. It doesn’t matter. It’s not your name. You are free. Love is a thousand things but at the center is a choice. It is a choice to love people. Left to myself, I get quiet and bitter and critical. I get angry. I feel sorry for myself. It is a choice to love people. It is a choice to be kind. It is a choice to be patient, to be honest, to live with grace. I would like to start making better choices. If you do some losing or you walk with someone in their defeat, live with dignity and grace. It is a middle finger to the darkness. If you love somebody, tell them. If there is conflict, let it go and fight instead for peace. Break the numb false silence and break the distance too. Laugh and cry and apologize and start again. This life is short and fragile but friendship is among the greatest miracles. More than anything, my wish for you is this: that when hour awful darkest days come, you will know you’re not alone. Pain will tell you to keep quiet, but that’s a lie. Life is fragile and we all break in different ways. I hope you know you can be honest. I hope you know you can ask for help. Did you catch that? It is absolutely positively okay to ask for help. It simply means you’re human. Jamie Tworkowski is the founder of To Write Love on Her Arms, a nonprofit movement dedicated to presenting hope and finding help for people struggling with depression, addiction, self-injury, and thoughts of suicide. 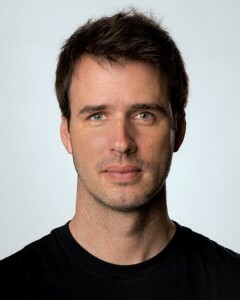 TWLOHA has one of the largest online audiences of any non-profit, and Jamie has been interviewed by NBC Nightly News, CBS’s Sunday Morning, andRolling Stone magazine, among others. He is the only nonmusician to win an MTVU Woodie Award. Jamie speaks frequently, telling the TWLOHA story and encouraging audiences at universities, concerts, and music festivals. A proud uncle, Jamie lives in Melbourne Beach, Florida, and loves surfing, music, and basketball.